Summer is here! And that means a new edition of North Sea Jazz is also here once more to pump up the quality of the Dutch festival landscape. Like always the festival lineup is packed with some great names. What to think of Quincy Jones, Stevie Wonder, Pharrell Williams, Sun Ra Arkestra, Dave Holland, Outkast and Pharoah Sanders, just to name a few. No wonder the festival was sold-out well in advance. Yesterday, around five o’clock, spectators began to pour into thirteen areas of the Ahoy venue, eagerly awaiting an evening filled with jazz, blues, R&B, soul and funk. So, enough chit chat now, let’s kick-off this live review of North Sea Jazz’s friday the 11th of July. What better way to start North Sea Jazz with one of Holland’s most talented altsaxophonists. The 26 year old Ben van Gelder, a 2013 semifinalist in the prestigious Thelonious Monk international Saxophone Competition, is a rising star in the jazz scene. During an interview he marks the spot of his career phase himself: ‘I learned music is not only about technique and study, but it’s also about personality’. Van Gelder, who resides in New York and is subsequently supported by North-American jazz musicians, is indeed still figuring out his style but is making giant steps in the process. In the well-filled Yenisei stage, the quintet mostly plays arrangements from Van Gelder’s second album, Reprise (2013). Although he looks a bit shy, Van Gelder does steals the show with some free solo’s and looks pleased when giving room to Sam Harris (piano) and Peter Schlamb (vibraphone). Especially Schlamb dexterous play is demanding and wonderful to watch. The quality of the quintet as a whole comes into play during exciting songs such as R.E.L., in which band members all take some space to improvise within their scores but still manage to keep the song together. As a festival opener the Ben van Gelder Quintet delivers a top class performance and proves its on the verge of a definitive breakthrough to the big leagues. 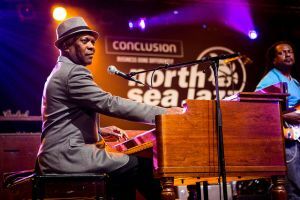 As you might know a long time ago North Sea Jazz branched off from being a pure jazz festival to a more encompassing festival that celebrates the various forms of black music. Therefore, my first steps in Ahoy shouldn’t be exclusively about jazz. 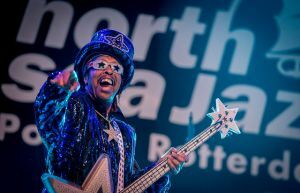 Luckily, regular attendee and master funkster Bootsy Collins is performing just around the corner with his 13-piece Funk Unity Band. And oh my, what a party. Collins, who constantly changes between various glitter outfits, a high hat and a white afro wig, whips up the crowd with some plucky base play. Meanwhile The Funk Unity Band, fullydressed in spacesuits, bring some catchy P-funk groove lines that make songs such as ‘I’d Rather Be With You‘ and ‘Bootzilla‘ impossible not to dance to. Oldtimer Collins, once a member of the backing bands of James Brown and George Clinton, goes complete over the top by presenting his glow-in-the-dark star shaped bass guitar and hereafter decides honor the audience with a real life visit. While hugging and dancing he walks into the crowd whilst The Funk Unity Band sloganeers ‘touch’ along with it. After security helpes Collins back on stage the party slowly comes to an end. Phew, absolutely a great and sparkling show. Now we’re all warmed up it’s best not to cool down. Next up in the Nile area is percussionist Sheila E. who gained fame in the late 80s by drumming under the wings of Prince and her appearance in the movie Sign “☮” the Times (1987). Programming a star of old like this therefore seems like a safe choice, but alas, it didn’t work out as planned. Why? Well, the show started with a 10 minute commercial about… Sheila E., making the crowd boo. Eventually the curtains went up and an energetic show began in which Sheila E. tried to make up some lost time. In the proces she was keen to quickly introduce Candy Dulfer (did her on-sax-mic work properly in the beginning?) who tagged along the way. At a piont Dulfer left the stage giving Sheila E. the opportunity to show of her skills as a percussionist. The crowd seemed mercilyful and was finally heating up, yet the setlist suppressed this mood for a lethargic ballad was next and, to make things more even peculiar, new commercial activities surrounding Sheila’s new album, ICON(2013), stopped the music for a few minutes. Hereafter Dulfer rejoined the stage and the show finally took off, although old school hits such a ‘A Love Bizarre‘ were performed in a compulsory manner. And that’s not what nostalgica should be about, if you ask me that is. Back to jazz now. 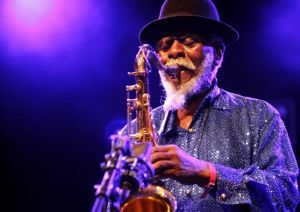 Living legend, tenor saxophonist Pharoah Sanders, truly played of the roof of the Hudson area. The 70 something Sanders is an impressive figure to watch. Firstly because of his clear grey beard, hat, shining blue jacket and his shuffling way of walking around the stage. The latter he made up with some high paced free jazz and harmonious bebop. It was special to hear the master bring times of old to life again. Whereas Pharoah Sanders is a representative of the rich history of jazz, Joshua Redman is among the great of today. Redman’s quartet is assisted by the string section of the Metropole Orchestra, a combination that’s rarely seen live. The cooperation between the quartet and orchestra was utterly beautiful and soothing to listen to. The interplat between conductor Jules Buckley and Redman felt very natural and I reckon this performance is probably of the highest quality of this years festival. On a few occasions Redman’s quartet take the spotlight for themselves by reframing a piece of J.S. Bach and playing songs from the Great American Song Book. 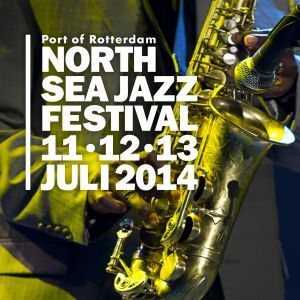 Gregory Porter is another North Sea Jazz regular, for the third year in a row Porter is present in Rotterdam. A year ago the big man opened the festival with the Metropole Orchestra and today he’s got a solo show at the Maas area. Although the Maas area is big, Porter doesn’t have any problems to fill the room with his impressive deep voice. Also the very powerful and fast alto sax play of Yosuke Sato got the hands of the crowd together. Songs from Be Good (2012), ‘On My Way To Harlem’, ‘Work Song’ and his latest album Liquid Spirit (2013), ‘No Love Dying’ were enthusiastically received by the audience. ‘Lovers unite’ seemed to be Porter’s main message. On to Mehliana, the project of pianist Brad Mehldau and drummer Mark Guiliana. Frankly I only got the chance to see the end of the show, but from what I saw, I can say is was pretty interesting. The duo experiments with drums and electronics and clearly wants to break through the standard conventions of jazz. During the part I was present Mehliana was working at full pace. Mehldau’s electronic piano was almost frantic while Guiliana’s drumming would fit perfectly in any heavy metal outfit. I’d better bookmark the duo’s album, Taming The Dragon (2014) on my ‘to listen list’. Hit machine Pharrell Williams was up next. Yet my visit to Mehliana caused for a delay, so once there, the Nile area was completely loaded with teenagers (and their parents) and other cheerful party animals. So instead I walked to the much smaller Congo stage seemed to be a better idea. Maybe I missed an opportunity here, but on the other hand, I’m a very happy guy anyway and moreover, Pharrell’s effective disco hits also serve as excellent walking (away) songs. After finally arriving at the Congo stage Brooker T. Jones just started his gig and from the first moment on you could see this performance would be one to remember. Jones started behind his organ and later on picked up his guitar to bring bluesy odes to Jimi Hendrix with ‘Hey Joe’ and Muddy Water with ‘Manish Boy’. After that Jones played a magnificent extented version of his 1962 hit he had with The MG’s, ‘Green Onions’. And with that another great visit to North Sea Jazz was almost about to end. On the way out a short visit to the Dutch jazz ensemble The Ploctones just couldn’t be resisted. Their set can be best characterized as frolic and controlled. Too bad the Darling area wasn’t even half full at the moment, they just didn’t deserve that. Festival programming should take that in account for next year. In the Maas area Tedeschi Trucks Band closed off the day. With a double set of drums, the strong slide guitar play and vocals of husband-and-wife musicians Derek Trucks and Susan Tedeschi some vigorous blues rock was blown into the hall without any remorse. Wow. ‘Going out with a bang’, is the phrase that fits best here. This entry was posted in WRM and tagged Ahoy, Be Good, Ben van Gelder, Ben van Gelder Quintet, black music, Bootsy Collins, Bootzilla, Brad Mehldau, Brooker T. Jones, Candy Dulfer, Dave Holland, Derek Trucks, Dutch, Funk Unity Band, George Clinton, Great American Song Book, Green Onions, Gregory Porter, groove, Hey Joe, Holland, I'd Rather Be With You, ICON, J.S. Bach, James Brown, Jazz, Jimi Hendrix, Joshua Redman, Jules Buckley, Liquid Spirit, live, Manish Boy, Mark Guiliana, Mehliana, Metropole Orchestra, Muddy Water, New York, No Love Dying, North Sea Jazz, North Sea Jazz Festival, North-American, On My Way To Harlem, Outkast, P-funk, Peter Schlamb, Pharoah Sanders, Pharrell Williams, Prince, Quincy Jones, R.E.L, Reprise, Rotterdam, Sam Harris, Sheila E., Sign “☮” the Times, Stevie Wonder, Sun Ra Arkestra, Susan Tedeschi, Taming The Dragon, Tedeschi Trucks Band, The MG’s, The Netherlands, The Ploctones, Thelonious Monk, Thelonious Monk international Saxophone Competition, Work Song, Yosuke Sato. Bookmark the permalink.